Always hold on to the truth. Don’t let others sway your heart. Don’t compromise yourself for the sake of temporal groovyness. Be Deeply Funky. Be separate from the crowd that’s awash with normality, by standing on a firm foundation. Never waver in your love or faith ….” – John Fluevog. This quote is my motto ten times over and pretty much describes me perfectly. Now I’ll tell you a little bit about me. I am Michele, the author, photographer, recipe developer and crazy lady behind this blog. Behind the scenes there is my hubby and love of my life and my three fabulous kids (who aren’t really kids anymore ) and two cats that complete the family. All of the above mentioned people in my family are also my beloved recipe testers (except the cats of course) and I have also been known to constantly make my neighbours eat my food. In my other life I am a wedding photographer in Windsor Ontario and have been blessed with the best clients and career a girl could ask for. Why a food blog you ask? Well, I guess it’s been a long time coming and I’ve finally taken the plunge. I’m sure you all want to hear all about my beginnings as a baker, so here it goes. I was mainly raised by a single father and after he burned down the apartment trying to cook my brother and I dinner, he quickly realized that he needed to be able to feed his small children and not make them homeless anymore. We headed to the bookstore where I was given the task of finding 3 cookbooks that had great pictures, and I’m pretty sure we left the store with Betty Crocker, Pillsbury and Better Homes and Gardens cookbooks. After a family meeting I was assigned the task of all things ‘baked and sweet’ and my father would do main courses (my little brother was 6.5 yrs so his task was eating). I was 9 yrs old at the time. Soon I was cranking out all the cookies and birthday cakes, making homemade gifts for teachers and my friends. This then turned into a teenage obsession for gingerbread making at Christmas and the search to find the perfect recipe for chocolate chip cookies. At the same time I was working with my father to learn to make meals, and spaghetti Saturdays were my favourite (we used to make gallons and gallons of sauce once every 2 months). I found baking exceptionally relaxing and I loved making people happy with my cooking. I got married to my high school sweetheart when we were 20 yrs old, and from there I spoiled my hubby with pie! Kids came early on, life got crazy, and I started baking up a storm just to relax. All our bread was homemade, I never bought store-bought cookies, and it was at that time I started getting asked to bake for others. I had a little catering business for quite a few years, making decadent cakes for special occasions, filling peoples freezers at Christmas-time with all of their childhood favourites, and catering luncheons, weddings and barbeques. All homemade, all from scratch, all by myself. The tides turned a few years ago when my kids started university, and I started a wedding photography business, but all the while baking and cooking along the way (just behind the scenes and not very often now). It wasn’t until I catered my daughter’s wedding shower and made almost all of the sweets and desserts for her wedding that I realized how much I missed really getting dirty in the kitchen. It had been too long. Now I am going to tackle my insane amount of cookbooks (I have a slight obsession) and blog about it. Do I have a ‘Little White Kitchen’ you ask? Well, not yet. 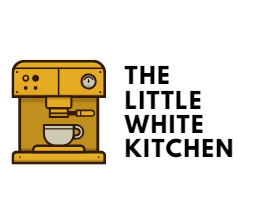 When I decided on the name for this blog I was still living at our previous home where I had recently renovated and designed my dream ‘Little White Kitchen’ but we’ve just moved into a house with a brown kitchen (gag me) and it will soon be coating a lovely coat of white paint!! So exciting!! Thanks so much for joining me on my journey.